This game was made for a game jam but I added it here for more feedback/roasts. 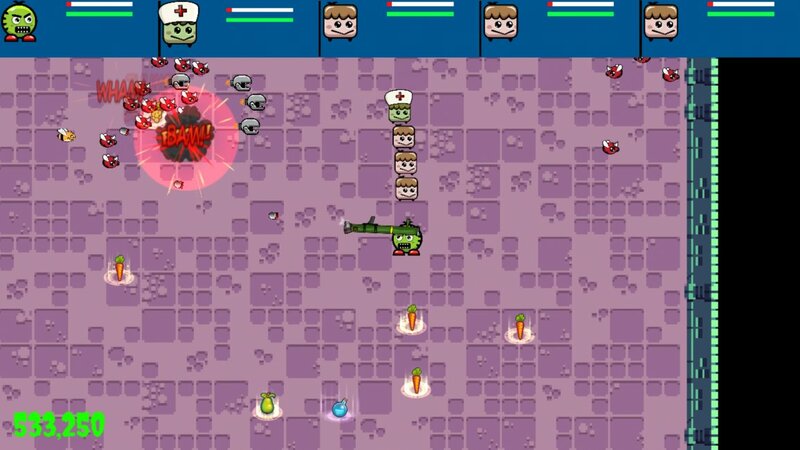 This is a fast paced top-down, dungeon-crawler, bullet-hell. Controls: Use WASD to move, mouse to aim and LMB to shoot (If there are any control issues, try switching to full-screen). In your adventure, you are accompanied by your friends. You need food to survive, but there is not enough food for everyone. Sacrifices must be made. -> You control the hero character and your party consists of a sidekick gunman, three civilians and a medic. Your party will follow you wherever you go. -> It is game over if the hunger meter goes full or if the hero is dead. -> You cannot pick health vials if the medic is dead. -> Theeffect of health and food pickups gets divided by the characters. So “Sacrifices must be made”. Special thanks to opengameart.org users Michele Bucelli and bevouliin.com for the graphics.